Rhinopias medley, Indonesia, originally uploaded by echeng. It is difficult to upload pictures from our current anchorage just off of Wai Verang in Indonesia. 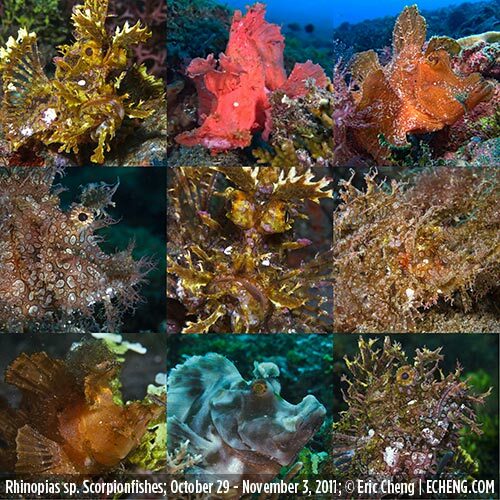 Hopefully, this compilation of some of the Rhinopias scorpionfish I've photographed over the past few days will make it online. These pictures were taken between October 29 and November 3, 2011. We have seen about 14 different individual Rhinopias in the last 6 days. I have pictures of 10 individuals, and 9 are shown here. Pictures were taken with a Canon 7D in a Nauticam housing, and with a Lytro light field pre-release camera. Sent from mobile. Apologies for brevity/typos.